JJ Abrams' Bad Robot teamed up with 126 National, which is devoted to helping children write, to create several gorgeous, mysterious items, including a bottle that's bigger on the inside than the outside. 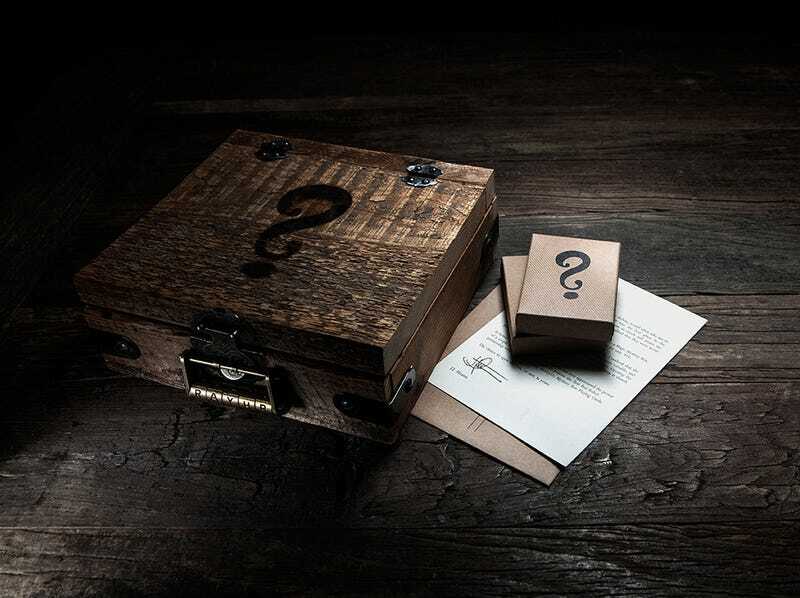 The lock box includes a letterpressed note from J.J. Abrams enclosed in a kraft paper envelope stamped with a black wax seal. Each lockbox is handcrafted. It’s an impossible object: a deck of cards, perfectly preserved inside of a solid glass bottle. The cards are real - sealed in cellophane and wrapped in kraft paper. The mystery: how did they get inside? The deck of cards is wider than the mouth of the bottle, and the glass is guaranteed to be a genuine, unaltered milk bottle. Shake it as much as you want - the deck cannot be moved or removed. Each bottle contains one deck of Mystery Box Playing Cards, created by JJ Abrams, Bad Robot, and theory11. The Mystery Bottle is an art piece handcrafted by Jamie D. Grant in Canada. He’s been featured in Ripley’s Believe It Or Not and TEDx Emory - but his secret method remains a mystery. Each bottle takes hours to create. It’s a labor of love that reminds all of us that the things we think impossible maybe - just maybe - might be within our grasp. $10 per bottle sold benefits 826 National, a non-profit that promotes creative writing in schools and workshops around the USA. Help us share the wonder.